One of the most interesting places to look for social commentary is … in corporate annual reports. The medium is ripe for gaffes, unmasked agendas and misdeeds, for example, Big Oil's unabashed proxy statement solicitations to shareholders each year to vote against greenhouse gas emissions goals and environmental impact reports (documented in this post and comments). General Mills. America’s processed food provider. The 'fattening of America' trend has treated General Mills well, the stock is up 15% this year to date (vs. the S&P 500's 12% decline) and up 40% since 2005. 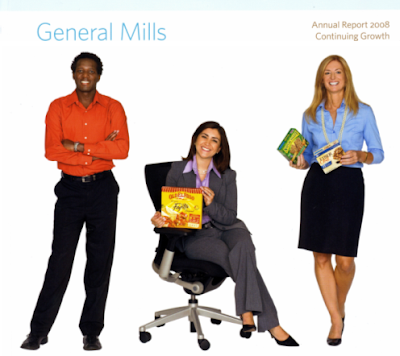 You be the judge - is the General Mills 2008 Annual Report a triumph of demographic marketing or would it be over the top to see it as a perpetuation of racial stereotyping? The Latina is featured center front with a Fajita product (go Hispanic demographic!). Why is she is the only one sitting? The fit-looking Caucasian woman, in pearls, is holding snack bars (because as a size 2, she is only entitled to diet food?). The African American man is holding nothing (what is the messaging here? General Mills does not have products (or jobs, see back cover) for African Americans?). Flipping to the back cover, another healthy looking Caucasian woman is holding party mix (sorority alumnae?). The older guy with the paunch is leaning on several cases of sugar-coated cereal, and the balding corporate executive is holding reports, not food items. Only the women and the overweight men have food? Where is that lucrative gay demographic? Or maybe the African American male is doing double duty as a metrosexual. Inside, the story continues. 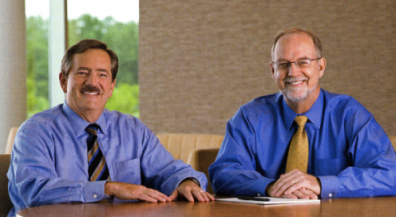 The Chairman and CEO jauntily appear, strangely without food products, though collegially in shirtsleeves.